HARDA: Every day, 60 Hindu households and temples in Harda town wait patiently for Akbar Khan and Amjad Khan to arrive. As soon as they notice these brothers pedaling in, they are relieved that their daily pooja (worship) to God would be well completed. Akbar, 33 and Amjad, 29, bring them supply of flowers and ritualistic leafs and grass blades (vilva patra and durva) daily from their own farm on the outskirts of the town. Since generations, the Khan family has been growing and supplying the pooja material to temples and Hindu households in the town. And even at time when a mere tweet on decibel of sound of Azan creates nationwide controversy, the Khan family and their Hindu clientele are silently spreading fragrance of communal harmony in a town considered somewhat sensitive. 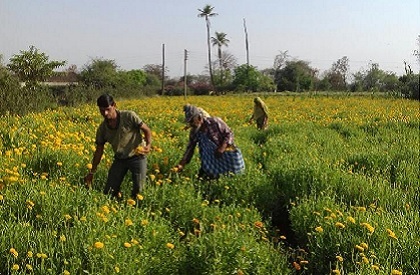 The family is headed by Anwar Khan, 65, who says that the work is being done from generations and currently they grow flowers and other material on two acre land at village Birjakhedi at the banks of River Ajnal. 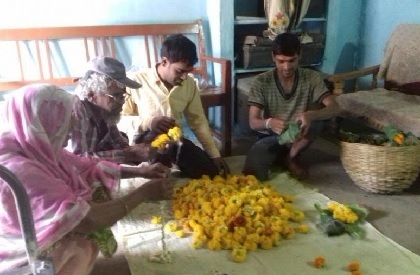 The family inclusive of Khan, his wife Sitara Bi, Akbar, Amjad and their respective wives pick up fresh flowers including marigold, rose, jasmin, leafs and grass blades from the farm everyday and prepare traditional packets to be supplied. 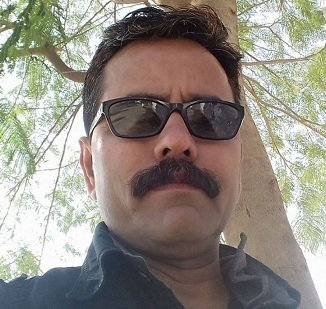 The two brothers – Akbar on his motorbike and Amjad on his bicycle – visit temple to temple and home to supplying the material for just Rs 150 per month. They also supply flowers to open market and sehra (flower headgear for Muslim grooms) on order. “I do this work since I was 10 years old and I find strange peace and satisfaction out of it. The flowers grown and picked by us are offered to God, what more can we ask for. Our earning is earning of devotion,” Amjad says. Anwar Khan mentioned that if the flower supply is disrupted even for a day, their Hindu clients call them up for know their well being and in case of any problem offer them instant help. “They never made us feel that we are Muslims and different. It is this love and brotherhood that is allowing us to carry on with this work. It is the will of Allah that we do this work and we do this like worship,” he says. His three daughters are married and youngest son Shahrukh works in Bhopal. The family has three more acre of land where they grown food grain for consumption.